Of the books published regarding hyperinflation, this may be the only one that provides effective strategies for operating a business under conditions of a rapidly depreciating currency. 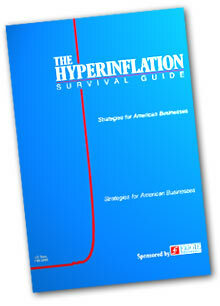 "The Hyperinflation Survival Guide: Strategies for American Businesses" was written by Dr. Gerald Swanson (an associate professor of economics at the University of Arizona). Harry E. Figgie, Jr. sponsored the research and production of this book. As it was originally printed in 1989, it was way ahead of its time. However, this doesn't change the fact that this book will prove to be an excellent resource for businessmen and individuals once the Federal Reserve's destruction of the U.S. dollar enters its terminal stage.